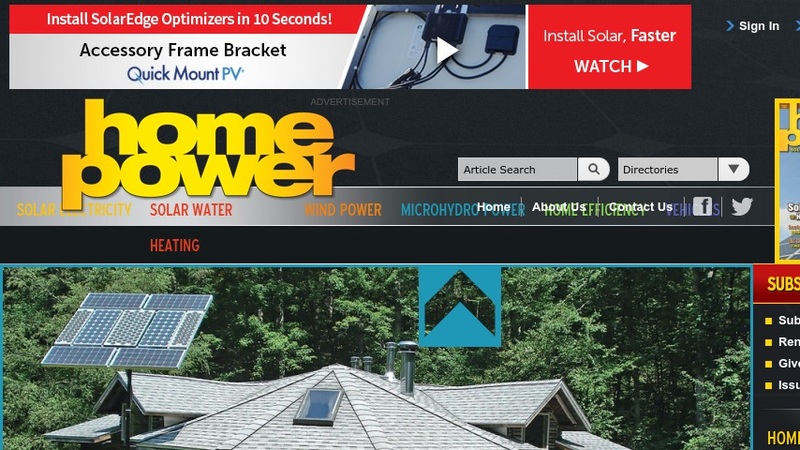 Home Power Magazine has been a resource for "home-scale renewable energy and sustainable living solutions" since 1987. Articles from the current issue of the magazine are available to download free of charge on this website. Some older articles are also posted in the Downloads section. For visitors wanting to find out what back issue to purchase, the HP archive includes a search function and purchasing information. Topics addressed include solar, wind, and microhydro electricity, home-energy efficiency, solar hot water systems, space heating and cooling, green building materials and home design, and efficient transportation. The information is intended to help home owners make informed decisions about home energy use by providing extensive product information, homeowner testimonials, buyer advice, and "how-to" instructions. Contributors include do-it-yourself homeowners, "innovative idealists," licensed electricians, and "pragmatic policymakers." The Resources section provides some background information on renewable energy, such as a glossary, recent news coverage, and updates on renewable energy companies in the stock market. Information on renewable energy events and energy fairs around the world can be found in the Events section.